Each year, Jan. 1 falls on a different day of the week, and the entire following year shifts accordingly. Schools, sports teams, businesses and banks spend many hours and millions of dollars calculating on what day of the week certain dates will fall, to schedule holidays and set interest rates. 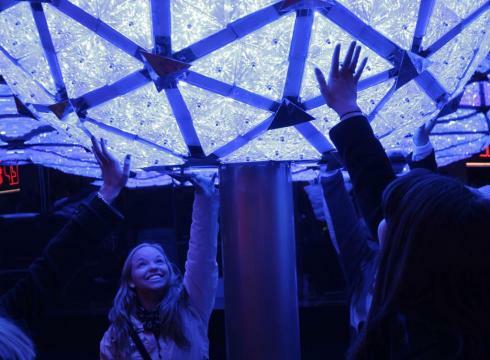 Kelsey Budnick and her high school friends pose for a picture with a ball that was used on a previous New Year's Eve in Times Square in New York. It doesn't need to be that complicated, say an astrophysicist and applied economist at Johns HopkinsUniversity in Baltimore. They have a proposal to make schedules simpler: a permanent calendar in which each 12-month period is exactly as the year before, on into perpetuity. The extra days created by the Earth's inconvenient 365.242-day orbit around the sun would be dealt with not by adding Feb. 29 for leap years, but by a leap week tacked onto the calendar at the end of December every five to six years. "It would simplify things enormously," says Richard Conn Henry, the professor of applied physics at Johns Hopkins who first proposed the idea in 2004. This past year he began to discuss the idea further with a colleague, Steve Hanke, a Johns Hopkins economics professor. The result is the Hanke-Henry Permanent Calendar, which they proposed in December. In it, March, June, September and December would have 31 days, all the rest 30. Christmas would always fall on a Sunday. Halloween would become Oct. 30 and always fall on a Monday. Hanke, who has helped seven countries introduce new currencies, estimates the change could save "roughly $130 billion" merely by decreasing the chance of interest-calculation errors resulting from incorrectly counting the number of days in a given month. There have been multiple proposals to change the calendar since the world began to shift from the Julian to the Gregorian calendar starting in 1582. Most suffer from what Henry calls "the Sabbath problem." Many religions require people to labor for six days but keep the seventh holy. Proposed calendars that break up the seven-day cycle destroy the count, meaning people could end up working on a day they should devote to spiritual matters. "That's unacceptable to millions of believers," Henry says. "You can't skip a day because then you're off kilter." Most people actually like having birthdays, holidays and sporting events move around, says David Finkleman, an astro-dynamicist at the Center for Space Standards and Innovation in Colorado Springs. Aside from that, creating a permanent calendar is "impossible," he says. The problem is that the period it takes the Earth to rotate on its axis (a day) and around the sun (a year) changes all the time and the change isn't predictable. Even more confounding, none of the periods divides evenly into another, he says. "The Lord didn't put things together synchronously," Finkleman says. And walk out of the bank carrying time in bags. The American poet and author of Iron John was born in 1926. At the holiday parties was now 'round my waist. And the way I'd not said, "No, thank you, please." 'Til all my additional ounces have vanished.